Localized scleroderma (morphea or linear scleroderma) involves the skin and subcutaneous tissue in one area, although there may be involvement of other organ systems. Presentation tends to be indolent, starting with superficial erythema of the skin that gradually spreads. There may be central clearing with a lilac ring appearance. With time, there is hardening of the skin or subdermal structures, leading to an ivory-like appearance of the tissue (95). Loss of hair and anhydrosis is common along with hypo-pigmentation or hyperpigmentation. Involvement of the deeper structures varies. Classification of localized scleroderma is based on clinical morphological findings and the depth of tissue involved (96,97). The terms localized scleroderma and morphea have often been used interchangeably, leading to confusion. Morphea is used by most rheuma-tologists to describe a subgroup of localized scleroderma that presents with oval-shaped patches or plaques characterized by thickening and induration of the skin and subcutaneous tissues without significant internal organ involvement (95,96). Lesions most frequently occur on the trunk, abdomen or proximal extremity (96,98). When active, the edges of the lesions are erythematous and may be warm. Plaques evolve from a sclerotic stage to a non-indurated stage, with skin softening and residual hypopigmentation or hyperpigmentation (95,98). Arthralgias, synovitis, joint contractures, leg-length discrepancy, and carpal tunnel syndrome can occur (96). Widespread dissemination is possible. If there are more than four plaques in two or more sites of the body, the condition tends to be called generalized morphea (95). 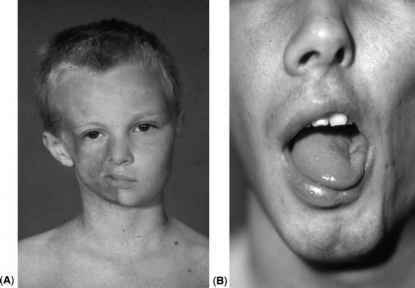 Figure 3 Linear scleroderma en coup de sabre (A) Facial appearance with right facial atrophy; (B) groove on tongue with and hypoplastic left side. Linear scleroderma is more common in the pediatric/adolescent age group than adults, whereas all other forms are more common in adults (96-98). The appearance of linear scleroderma, especially when involving the face, or associated with localized skeletal growth abnormalities, may be particularly distressing for the adolescent and psychological support may be necessary. Linear scleroderma usually occurs in children less than 10 years of age with activity lasting a median of 5 years (96). In contrast to morphea, it involves underlying tissues. The sclerodermatous lesions may be warm and erythematous when active, especially at the lesional margins. Lesions may extend at a variable rate, and cause reduced range of movement when crossing joints (95). Contractures of periarticular and ligamentous tissues occur with muscle wasting and significant growth failure of a limb (95). Esophageal involvement has been reported, although rare, and internal organ involvement has been described (67). Parry-Romberg syndrome is a term used to describe hemifacial atrophy of bone, subcutaneous tissue, and adipose tissue, with relative sparing of the superficial skin tissues (95,98). It involves dysplasia of the skin and underlying bone of the face and skull unilaterally. Changes are diffuse and uniform. Hair is normal. There is greater involvement of the lower face than there is in en coup de sabre (95). It occurs in the first to second decade of life and can be associated with neurological deficits, uveitis, and atrophy of the pinna or tongue on the involved side. Whether scleroderma en coup de sabre and Parry-Romberg syndrome are part of the same spectrum or a different entity, remains controversial. Both can involve neurological, ocular, and vascular abnormalities. CSF abnormalities can occur with oligoclonal bands, and anti-nuclear antigen (ANA) can be positive in both (95,98). However there are differences in histology and distribution. Parry-Romberg can coexist with localized scleroderma, or can occur as a sequel to various conditions. Mixed forms of localized scleroderma can occur with the presence of morphea plaques and linear bands in the same individual. Localized scleroderma is essentially a clinical diagnosis, but investigations may be supportive. Hypergammaglobulinemia and eosinophilia have been suggested as indicating active disease. ANA is positive in 28% to 76% of cases of localized scleroderma (94,98). Occasionally, antibodies to extractable nuclear antigens are seen, such as anti-Ro. Rheumatoid factor and anti-histone antibodies may also be positive. ESR and CRP are rarely elevated. Thermography and high frequency ultrasound show promise in helping clinical decision of ongoing disease activity. MRI can also be useful, particularly to visualize intraorbital and intracranial lesions (95). Localized scleroderma tends to be most progressive within the first two years. It may continue to spread or deepen in involvement for up to 5 to 6 years, but then seems to stop (95,98). Even without treatment, lesions usually spontaneously enter remission after 3 to 5 years. However, as children grow, milder lesions may become more evident. Localized scleroderma very occasionally evolves, or is seen in association with systemic sclerosis or other connective tissue disorders (98,99). One of the major differences in management of young people with scler-oderma compared to an adult population is monitoring for associated growth abnormalities (96,98). Treatments for scleroderma are based on anecdotal reports, case series and personal experience. Therapies have included the use of topical corticosteroid creams, topical mycophenolate mofetil (MMF), intra-lesional steroids and intralesional interferon g.
Systemic therapies have also been tried including steroids, methotrexate, ciclosporin, MMF, hydroxychloroquine, D-penicillamine, phenytoin, cyclo-phenyl, vitamin D or vitamin D analogues, vitamin E, vitamin B12 injections, sulphasalazine, bismuth, and etrinate (96,98). The use of ultraviolet light, with or without chemical agents such as psoralen, has been reported as showing some clinical benefit particularly for localized or superficial lesions (95). It is difficult to know when the disease becomes inactive, but the usual practice in children is to treat with immunosuppressive therapy for a minimum of five years, while weaning prednisolone over six months. Combination therapy may lead to earlier resolution of complicated lesions (98). Physiotherapy and occupational therapy are important when lesions cross joint lines to help prevent or reduce joint contractures, and improve function (95,98). Splints and orthoses may be useful. Plastic surgery techniques have been used to correct atrophy and scarring (100-103). For best results, surgery should be carried out when lesions are inactive, as otherwise, the imported tissue can become affected in the disease process. If it is imperative to do surgery while the lesion is active, for psychological reasons, surgery should be kept as simple as possible so that reconstructive surgery is possible at a later date. Surgical options include free fat grafting, autologous dermofat grafting, osteotomies, and bony augmentation with soft-tissue expansion and vascularized free-tissue transfer.